Duke Energy’s (DUK) history dates back to the early 1900s, and the company is the largest electric utility in the country today, serving approximately 7.7 million electric customers and 1.6 million gas customers across the Southeast and Midwest regions of the U.S. 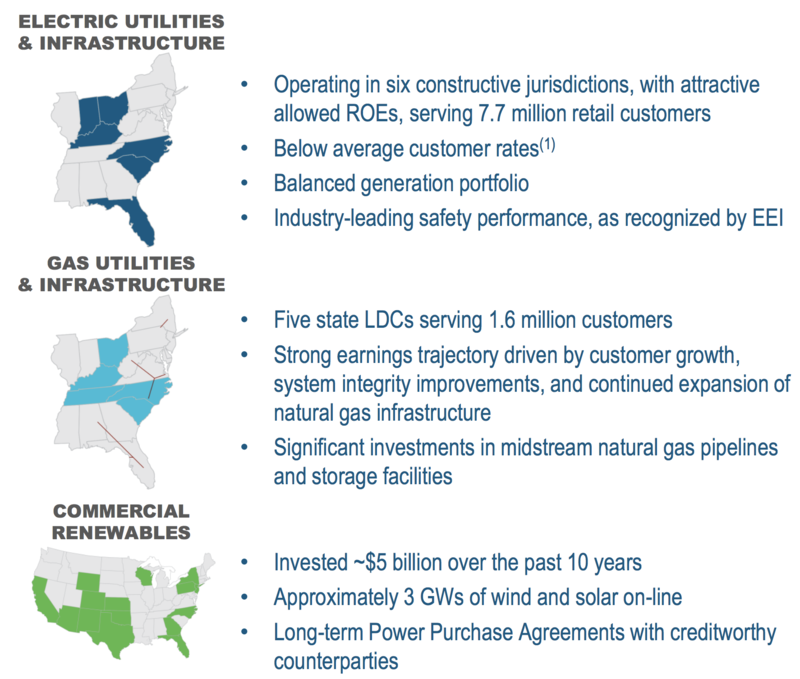 Regulated electric utilities and infrastructure account for 85% of Duke Energy’s earnings, but the company also has a fast-growing gas infrastructure and utilities business (9%) and a commercial portfolio of renewables (6%). A blend of residential (32%), commercial (30%), industrial (21%), and wholesale (17%) customers make up the company's mix. 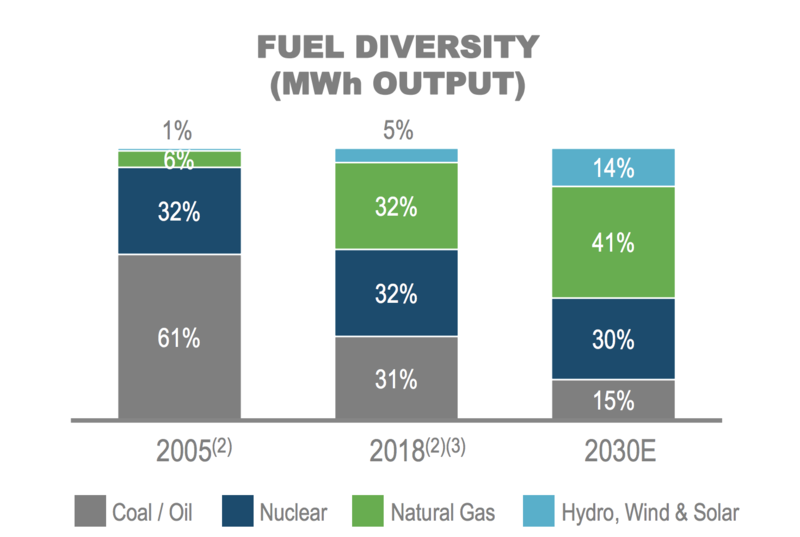 It's also worth noting that Duke Energy continues investing in cleaner power generation, which has helped reduce its fuel mix of coal and oil from 61% in 2005 to about 30% today. Management targets a 40% reduction in CO2 emissions by 2030 from 2005 levels, driven by a significant expansion in gas and renewable energy generation and a continued decline in coal generating capacity. Adjusting for its 2007 spin-off of Spectra Energy, a natural gas pipeline business that steadily grew its dividend until Enbridge acquired it in 2017, Duke Energy has paid uninterrupted dividends for 92 years and increased its payout in each of the last 12 years. Many utility companies are essentially government regulated monopolies in the regions they operate in. In fact, aside from in Ohio, all of Duke’s electric utilities operate as sole suppliers within their service territories. This is done to keep rates reasonable for consumers while providing utility companies with enough of an incentive to earn a reasonable return on their investments made to provide safe and reliable service. The company has earned a healthy return on equity between 8.5% and 12% in each of its regions over the last few years. For context, in the first half of 2018 the average vertically integrated electric utility was permitted a 9.7%return on equity, according to S&P Global Market Intelligence. 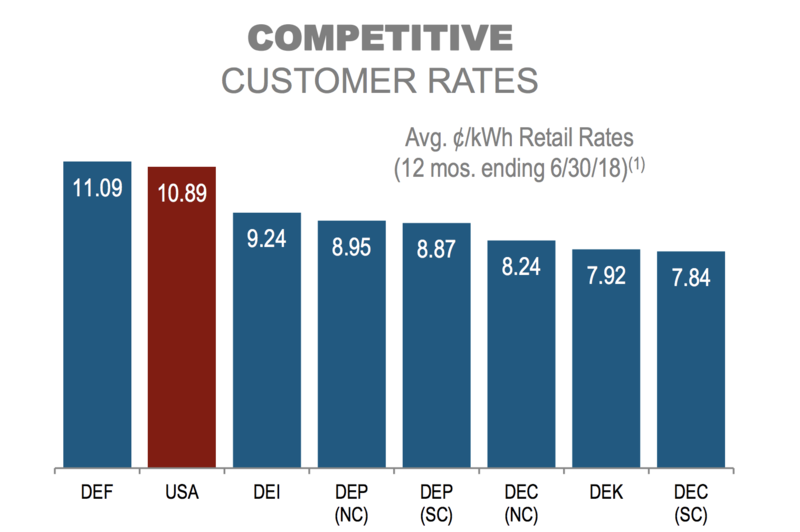 These returns seem likely to remain stable over the coming years, in part because the rates charged to most of Duke Energy’s customers remain below the nationwide average (only one of the company’s regions, Florida, charges a slightly higher rate). In other words, the utility's efficient operations are supportive of the firm's constructive relationship with regulators. This favorable rate differential could also make it somewhat easier for Duke Energy to win approval for higher rates in the coming years, supporting the returns earned by its ongoing growth projects. Customer growth remains positive (about 1.5% per year) across the company’s regions as well, supporting a base level of volume growth in Duke Energy’s large electric and gas businesses. The company's growth rate in both customers and volumes isn't fast in absolute terms, but it is consistent with overall industry growth rates. Combined with the firm's ongoing cost management efforts, this growth has helped support Duke Energy’s return on equity even without significant rate cases until very recently (in some states the first increases since at least 2013). Then, in October 2015, Duke Energy announced a deal to acquire Piedmont Natural Gas for $4.9 billion to boost its push into gas. 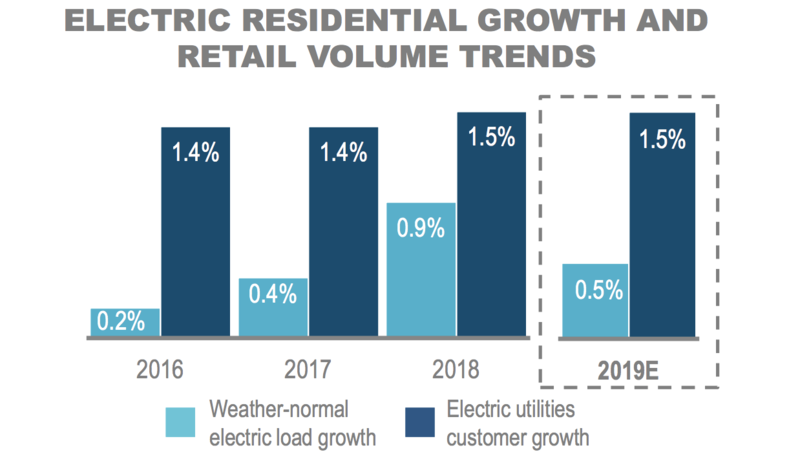 Compared to electricity sales, which seem likely to slow as energy usage becomes increasingly efficient, gas has a much stronger growth profile. This is because new pipelines coming online will allow gas to replace dirtier power sources such as coal in regions where gas was previously inaccessible. Piedmont's operations establish a platform for future growth in gas infrastructure projects and will be further expanded to help with Duke’s ongoing conversion from coal to gas power. In fact, management expects its business mix from natural gas to expand from 9% of earnings today to 15% by 2026. Besides acquisitions, Duke Energy has disposed of non-strategic assets to lower its risk profile and improve the quality of its earnings. For example, management sold the company’s merchant Midwest commercial generation business to Dynergy for $2.9 billion in early 2015 and divested its struggling international energy business for over $2 billion dollars in 2016. Going forward, Duke Energy has $37 billion of growth projects planned through 2023 which are expected to drive 4% to 6% annual earnings growth (and a similar rate of dividend growth). 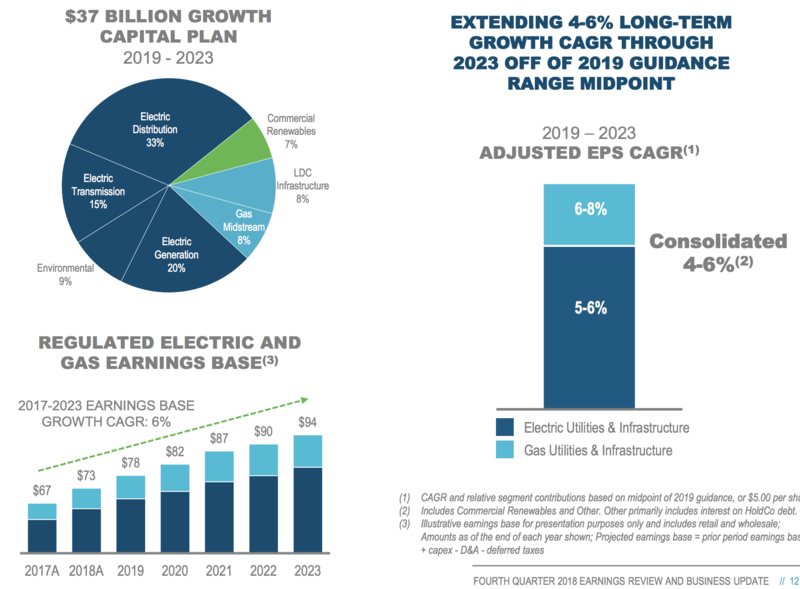 Duke Energy's earnings growth is also driven by relatively low risk activities – base rate increases, investment riders, major capital projects to modernize the grid, and growth in its gas utilities & infrastructure business. To continue funding its growth plans, Duke Energy will rely on its investment-grade balance sheet. Each of Duke Energy's operating companies enjoys at least an A- credit rating from S&P as well. Combined with management's reasonable target payout ratio of 65% to 75%, the company should have no trouble continuing to grow its dividend while also investing for the future. Overall, Duke Energy appears to have a strong moat and a decent outlook for growth (for a utility). The company has excellent scale as the largest electric utility in the country, owns a portfolio of complementary businesses with numerous growth opportunities, and operates primarily in regions with generally constructive regulatory frameworks and solid demographic trends. That being said, even regulated utilities still face some potential challenges. However, the company is banking on these conditions remaining stable as it continues investing for growth and depending on states to approve several rate cases it filed in 2018 in order to earn a fair return on its capital-intensive investments. 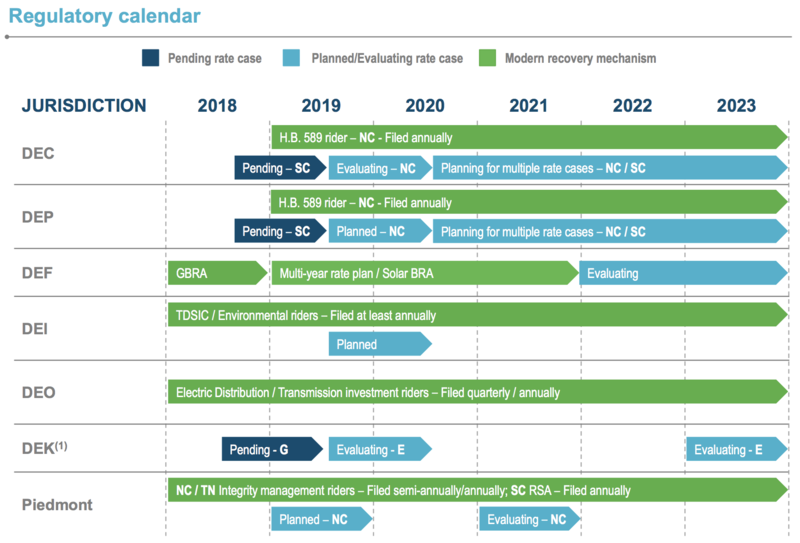 While Florida has already provided the company with rate clarity through 2021, in the Carolinas the firm is forced to make more frequent annual rate cases, which makes future allowed returns on equity less certain. In other words, the company's diversified geography can act as a double-edged sword, because it faces more frequent rate case outcomes across its business that might not prove as favorable as in the past. 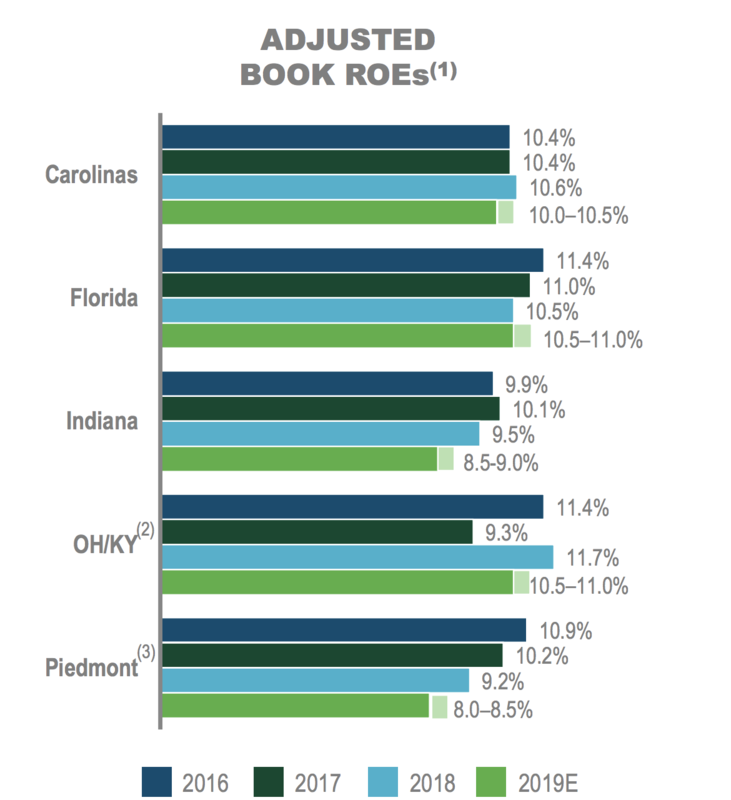 Allowed returns on equity have slowly trended down for both Duke Energy and other utilities across the country in recent years, especially in some of its more profitable markets (like Florida). Future rate cases can be impacted by political pressure as well, including environment scandals like the coal ash spill in North Carolina. On a related note, the Environmental Protection Agency (EPA) also creates risk for utility companies in the form of enhanced safety and emissions standards. Duke Energy estimated that its notorious coal ash spill, which took place in North Carolina in 2014, could require cleanup costs in excess of$5 billion over the long term. The company had hoped to pass on these higher costs to ratepayers (with an 8.5% rate increase to cover cleanup costs), but in mid-2018 North Carolina's Utility Commission denied the company its rate increase and ordered it to refund $70 million it had already collected in higher electric rates over the spill's costs. Under the 2018 North Carolina rate case decision, Duke Energy received approval to recover deferred coal ash costs over a five-year period, with the full debt and equity return. Importantly, the company's guaranteed profit level also remained at 9.9%, in line with recent years (some investors feared it would be decreased to at least 8.5%). Better news for the company came from Kentucky and Ohio, where its allowed return on equity was approved at 9.7% to 9.8%, slightly higher than in 2017 and what management was expecting in 2018. Furthermore, in Ohio regulators locked in a 9.8% return on equity through 2025, giving the utility long-term visibility. Another regulatory risk to be aware of is on the faster-growing gas side of the business. Most notably, Duke Energy's joint venture with Dominion Energy (D) for the Atlantic Coast Pipeline continues to face major legal challenges from environmentalists. Duke Energy owns 47% of this 600-mile pipeline project. Challenges to the pipeline's regulatory permits have delayed its completion by about nine months already and raised its cost estimate by $500 million. The $7-plus billion project could ultimately end up costing $1.25 billion more than expected and go into service two years behind schedule (2021). Major pipeline projects naturally have high execution risk because legal challenges are fairly common, especially for long pipelines that cross several states and require various permits from local, state, and federal regulators. Fortunately, Duke Energy's business is quite diversified (multiple growth drivers outside of this project), and the company appears to have the financial strength and flexibility to manage through almost any future setback the pipeline might face. Duke Energy has about $2.5 billion earmarked for growth investments in renewables over the next five years, but it’s still a relatively small proportion of the overall business (6% of earnings). The company’s acquisition of Piedmont also helps the company with growth outside of regulated electric utility services, but as we're seeing with the Atlantic Coast Pipeline project, the gas business can face its fair share of challenges. While there are some longer-term risks such as lower electricity usage, the rise of clean energy, and the company’s major growth investments, Duke Energy seems likely to remain a reliable and appealing dividend growth investment for many years to come.